In a blender, add together all the cheese ingredients except for the probiotics and dried herbs. Add more water if necessary for blending. Puree for several minutes until as smooth and creamy as possible. Pour into a jar or other glass container and cover with cheese cloth. Let sit for about 24 hours at room temperature to develop a cheese flavor. As it sits, the nut "cream" will also thicken up, making it easier to handle. Once the flavor has developed to your liking (taste test every so often), divide in three equal portions and form into circles. Wrap each in the cheese cloth and place them in a colander with a weight or weighted plate on top. Put the colander in a sink or over a plate or bowl to catch any drips. A lot of the liquid will be pressed out of the cheese this way. Let it press for several hours. This doesn't get gooey and it will be the consistency of firm cream cheese. Further pressing can make it a bit more firm. When it has the desired consistency, remove from the cheese cloth, shape into a wheel and roll in dried or minced fresh herbs (optional). For a harder rind on your cheese, place entire cheese wheel into dehydrator for several hours. *edited to add soaking nuts to directions and decrease water from 1 1/2 to 1 cup. I'm trying to eat more raw foods. Not sure if I'll ever go completely raw but I love your posts and having cheese ..... mmmmm. Oh, and I pinned so I can come back to this! the cheese texture looks so good! Where do you find your probiotic powder? I'm with foodfeud - I'm new to probiotic powder. Where do you find yours? What brand? What other uses have you found for it? Thanks! Hi Tasty Eats :). I'm not an expert on probiotics, but this is a good one. You had me with "cheese"!! Yum!! As always - fabulous post!! I love it here!!!! What sort of nuts did you use ? Your nutritional information is for which quantity? Thank you! Hi Yasmine, the recipe is for a really basic nut cheese, so any kind of nuts can be used. The flavor will be a little different, of course, depending on what you use. The nutritional information is for 1/8th of the recipe. oh my goodness, this looks amazing. I love it! I appreciate that you put nutritional statistics with your recipes. Thanks! BTW, they look marvelous and I'll look forward to trying them. It seems like usually we soak nuts for cheese, but you don't soak the nuts first for this one? Hi Mari, thanks for pointing that out. I've edited the directions to add soaking! Yes, they seem to freeze really well. Wow! love the graphics on your blog too! seriously inspired! I made it and mine tastes sour. Its been less than 24 hrs. Do you think I let it go too long? What type of nut, and herbs did you use? Two questions: Why the probiotic tablet, is it to ferment the cheese? If it is, it leads to my second question: Can I use active yeast instead? No, active yeast is a whole different organism. 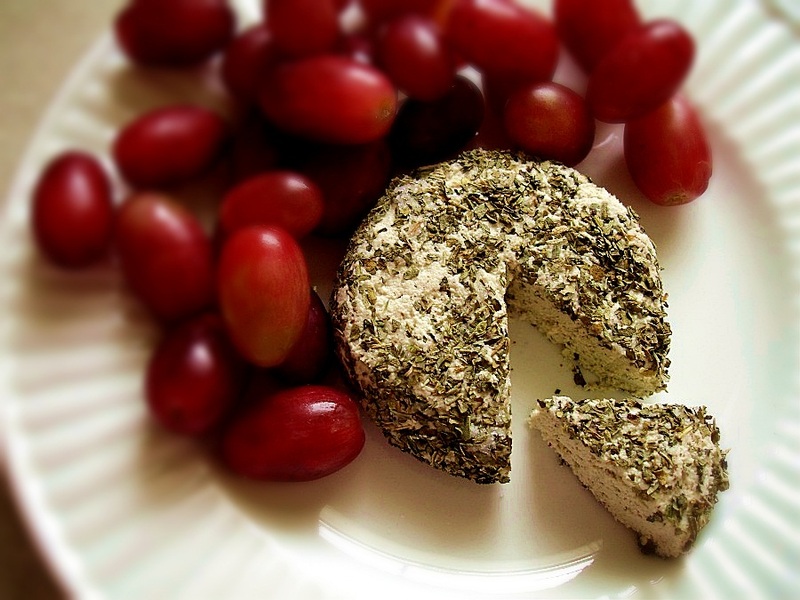 Probiotic powder is what's used for cheeses. Although, even the probiotic powder is optional. This makes a really nice cheese without it. With hazelnuts do you have to remove the brown 'skin' on the nut first? Hi Gendi ... I think you could do it either way, remove the skins or not. The color will be lighter if you remove the skins but it really shouldn't affect the taste much. Thanks for your reply. How long once made is it likely to keep in the fridge. I unexpectedly have to go away for a few days. awesome post, like your food.